Can China's unmanned aircraft match the U.S.-made Predator and Reaper? 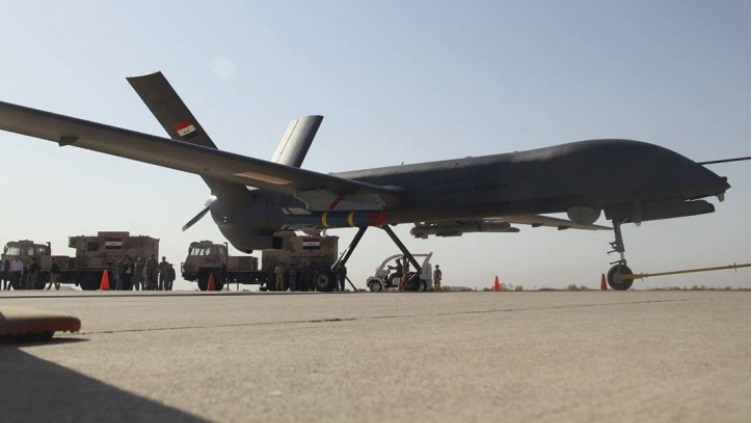 Last year the Iraqi military took delivery of three Chinese CH-4 Cai Hong drones, an aircraft that, according to its creators, is better than the American MQ-1B Predator. That claim is now being put to the test as the drones carry out strikes against ISIS with bombs and laser-guided missiles. The CH-4s are flying from Al-Hayy airbase in support of operations in Anbar province, site of Ramadi and Fallujah, where heavy fighting has been taking place. A recent Iraqi video (warning: graphic combat footage) shows four drone strikes, and claims that the drones destroyed one suicide car bomb before it could be used, two other vehicles carrying fighters, and a covered trench occupied by ISIS. The Cai Hong-4 ( "Rainbow 4") was developed by China Aerospace Science and Technology Corporation, the nation's leading military drone makers. It first flew in 2011. While it bears some resemblance to the Predator, it is larger, with a wingspan of 60 feet and a maximum take-off weight of 3,000 lbs., compared to the 50-foot wingspan and 2,250 lbs. of the Predator. This gives it a payload 750 lbs. and an endurance of 38 hours, compared to 450 pounds and 24 hours for the Predator. The CH-4s in Iraq are armed with a mixture of missiles and bombs. The laser-guided AR-1 is China's answer to the Hellfire, but is slightly faster—it's supersonic rather than subsonic, so it cannot be heard until it hits. The FT-9 is a 100-lb. satellite-guided bomb with a claimed accuracy of better than 15 feet. The makers deny that it relies on the American-built GPS system, so the weapons may use the Russian GLONASS or even the new Chinese Beidou navigation satellites. The CH-4 may indeed be superior to the Predator, but the U.S. moved several years ago to production of the MQ-9 Reaper (also known as Predator B) which is more than three times the size of the original. It has a 14-hour endurance and carries almost 4,000 lbs. of bombs, making it much more like a manned aircraft in capability. In 2015 CASC unveiled the CH-5, which is closer to the Reaper in scale. Perhaps the real test of the CH-4 will be whether it is cheap enough to be replaced every time one is lost. One of the main advantages of unmanned aircraft is losing one carries none of the political consequences of losing a pilot, so they can be flown on hazardous missions. At about $5 million a pop, the Predators were regarded as more or less expendable, something which does not apply to the $30 million Reaper. If CASC can produce efficient, low-cost combat drones, then they may come to dominate the military market the way that DJI have dominated the civilian drone market. The U.S. may have invented drone warfare, but the field may end up being owned by someone else. And CASC are already offering small tactical drones for export. الحديث عن ان سعر الصاروخ يتجاوز 150 الف دولار هو كلام غير معقول وغير منطقي لعدة اسباب منها ان هذا السعر هو ضعف سعر الهلفاير رغم ان الجميع يعرفون ان سعر المنتجات الصينية لايزيد عن ربع سعر المنتجات الغربية.. سبب اخر ان الصين تسعى لدخول السوق فمن سيشتري بهذا السعر؟؟ اما العبادي يكذب او ان الموضوع فيه فضيحة فساد كبرى..
غريبة غريبة ... هل من الممكن ان تكون صواريخ مخفضة المواصفات لاغراض التدريب مثلا وباعها الامريكان لنا ؟! كشفت النائبة عالية نصيف، الخميس، عن "مخالفات وشبهات فساد" بصفقة تسليح مع شركة صينية، وفي الوقت الذي طالبت بالتحقيق فيها، اكدت ان شركات اخرى قدمت عروضا مع هذه الشركة وتم ابعادها. وقالت نصيف في حديث لـ السومرية نيوز ان "هناك مخالفات وشبهات فساد تخالف تعليمات العقود الحكومية من قبل مدير عام التجهيز والتسليح ب‍وزارة الدفاع حيث تم التعاقد مع شركة بولي الصينية لشراء عتاد بقيمة 200 مليون دولار خلافا للضوابط والتعليمات". وأضافت نصيف انه "تم توجيه كتاب الى المفتش العام لوزارة الدفاع للتحقيق في ذلك"، مبينة ان "العقد قد تم توقيعه مع الشركة الصينية في الاول من اذار عام 2016". وأشارت نصيف الى ان "العقد الذي تم توقيعه كان مخالف لتعليمات العقود حيث تم الاتفاق مع الشركة الصينية في وقت قدمت شركات اخرى للتعاقد بهذا الشان وتم ابعادها بالاتفاق مع هذه الشركة". افاد مصدر امني في محافظة نينوى، السبت، بأن 20 عنصرا من تنظيم "داعش" قتلوا بقصف لاول طائرة مسيرة عراقية في الساحل الايمن لمدينة الموصل. وقال المصدر في حديث لـ السومرية نيوز، إن "طيران الجيش وجه، اليوم، ضربة جوية بواسطة الطائرة المسيرة CH4 على تجمع لعناصر داعش في منطقة الكورنيش ضمن الساحل الايمن، ما اسفر عن مقتل 20 عنصرا منهم". واضاف المصدر الذي طلب عدم الكشف عن اسمه، ان "هذا النوع من الطائرات يقصف لاول مرة تجمعات داعش في الساحل الايمن من المدينة"، مشيرا الى ان "العملية كانت استباقية ودقيقة واستندت الى معلومات استخبارية قادت لاستهداف التجمع الذي يعتبر مهماً لدى التنظيم". Iraq's previous experience with CH-4 is very good, according them, CH-4 have conducted 100+ strike missions with 200+ attacks and 95% hit accuracy, this is better than the much more expensive US-made UAV's 90% hit accuracy. CH-4 is a smaller UAV, with roughly 30 hours' cruise time and 200 kg payload. CH-5 is a much upgraded UAV, with 60 hours' cruise time and 900kg payload. Both CH-4/5 are entire built for exportation purpose. The performance of CH-4 is also one key reason Iraq DoD placed another $2.5 billion order to China for VT-4 tanks and HQ-9 SAM last year.